Below: Not sure of all the things to do at Hershey Park or what you should do while you’re on vacation there? This post gives you a complete overview, from rides to shows to games to food and everything in between. Plan ahead to make the most of your day at the famous theme park. A huge thanks to Hershey Park for providing us with the tickets for our visit. 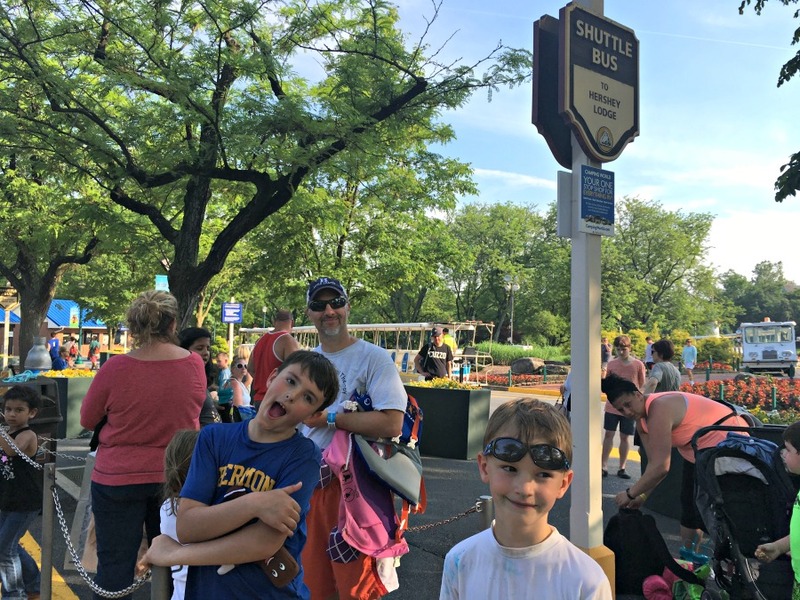 We were there before the gates opened, eagerly waiting in a giant crowd of families and school groups, ready for a day of fun in Hershey Park. I was certain, given the size of the crowd, that it would be a madhouse as soon as we had our tickets scanned, but the crowd quickly dissipated as groups went in various directions to get to their favorite park attractions. We, on the other hand, stood near the entrance, map in hand, trying to figure out how to begin our day. In retrospect it would have been wise to have looked through all the info ahead of time so we knew what was on our “Must Do” list, but instead we took a more casual approach to the day. It worked out fine, but I know we missed a lot of rides and attractions that the kids would have enjoyed. 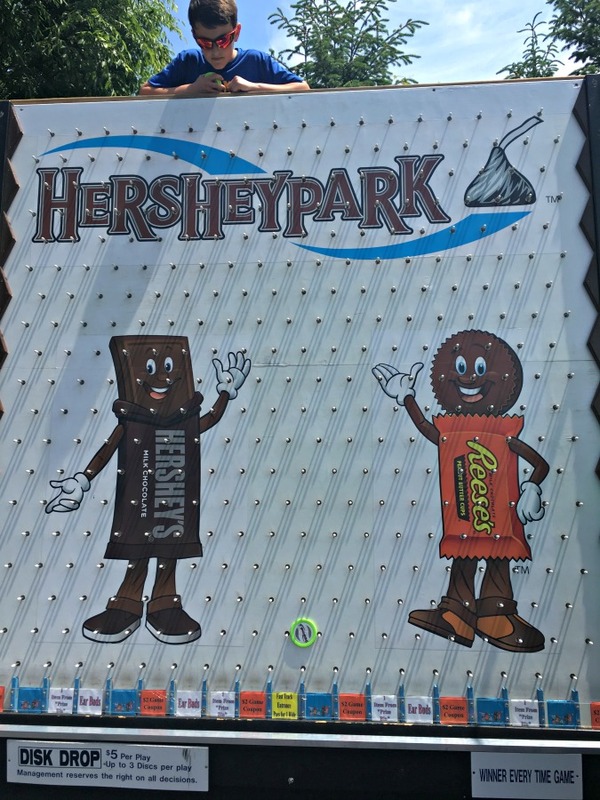 If you’re planning a trip to Hershey, PA and want to know what things to do at Hershey Park, you’ve come to the right place! This post will give you an overview of the rides, games, food, and attractions you’ll discover there and help you decide what to put on your “Must Do” list before you arrive. 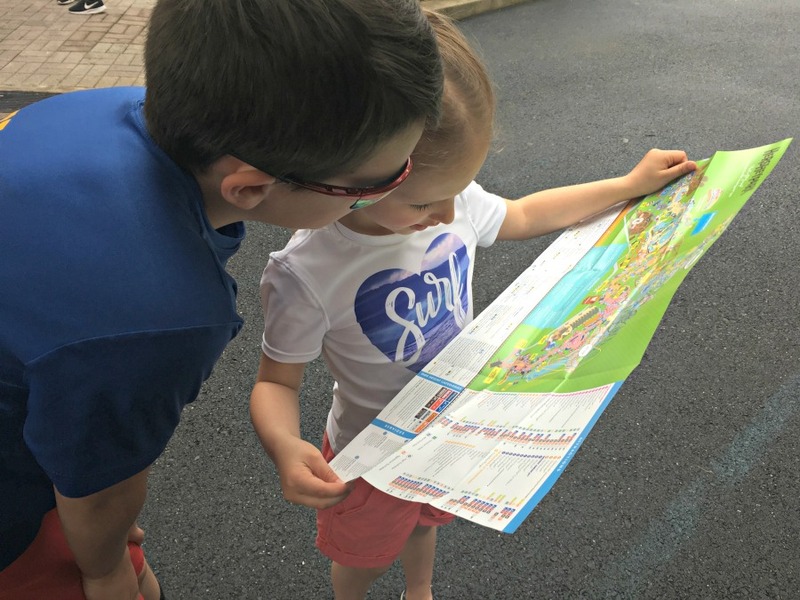 If you have young kids or kids who prefer smaller adventures, there’s plenty for them to do at Hershey Park. There are over 20 rides just for the small set. My daughter especially loved the carousel, as well as the helicopters. 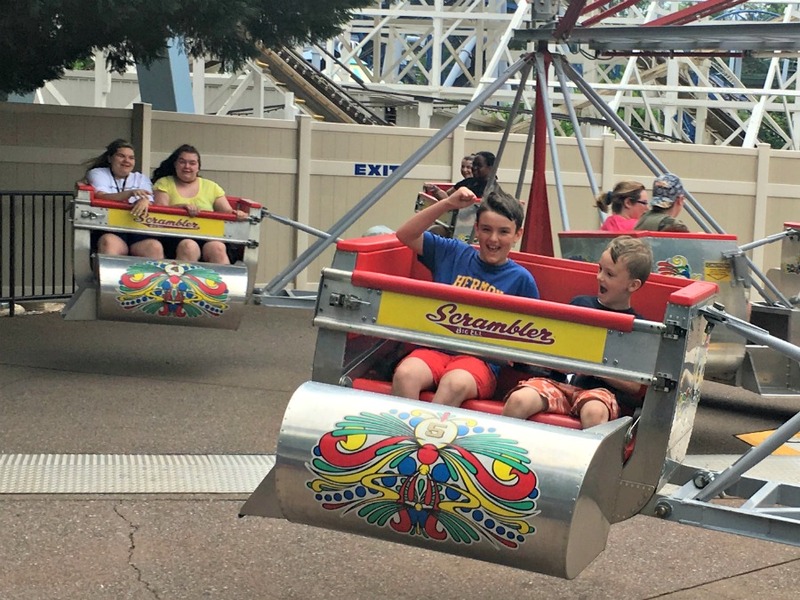 There are quite a few carnival-style rides at Hershey Park that my kids had a blast on. The boys loved the Tilt-a-Whirl and the Scrambler. Bonus: Our family hit a new milestone on this vacation- our 10-year-old was big enough to be the “companion rider” for his brother. That meant my husband and I didn’t have to get dizzy on all those spinning rides. If you haven’t hit this milestone yet, it’s definitely one to look forward to! Hershey has a LOT of roller coasters; 14 to be exact (one of those is a water roller coaster). All of us went on the smallest coaster, the Cocoa Cruiser. The boys loved it and went several times in a row, but our daughter was not a fan. She prefers tamer rides, so I was proud of her for being willing to try it. We also tried out the Wild Mouse (fun! ), and our favorite of the day was the Lightening Racer. It’s a wooden coaster, so it’s not the smoothest ride, but it features a double track so you’re actually racing another coaster on the ride (ours won, woot!). 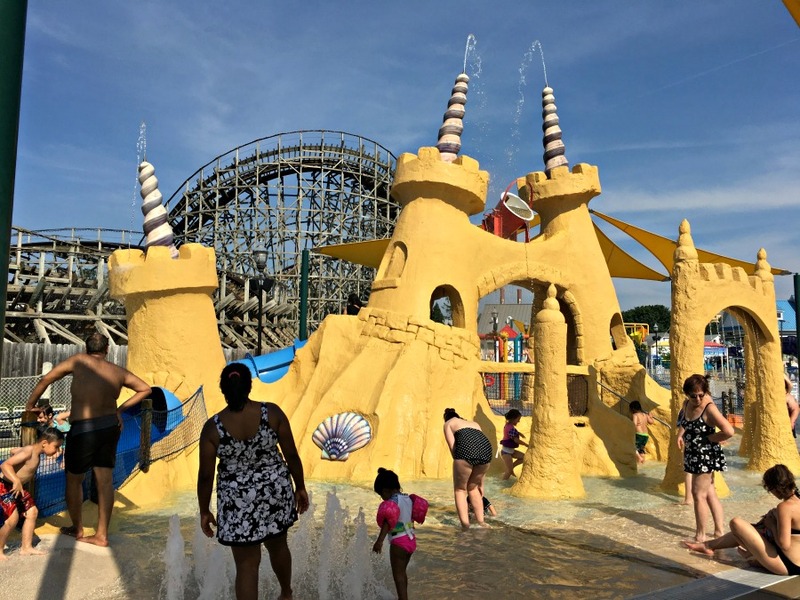 The Boardwalk is Hershey Park’s water park and what fun it is! We spent about half of our day here and had a blast. Just as with the non-water rides, there’s something for every age and adventure level here. Annelise loved Sandcastle Cove, a spot made just for younger kids. All of us had fun at East Coast Waterworks. It’s like a giant water playground. 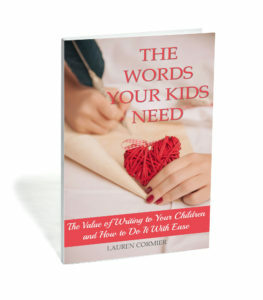 It can be tough to keep track of your kids on it because it’s so big, but the entire area is fenced in with only one way in and out, so if you station yourself near the exit, you shouldn’t lose anyone. The boys went with their dad on some of the bigger water rides, including Tidal Force and the brand new Whitecap Racer. The Whitecap Racer is really fun because it times each rider and shows what order they finish in. As you stroll through the Midway you’ll find a lot of games to play for an extra fee. Annelise spotted a Whack-a-Mole style game she wanted to try, and since we were the only two there at the time, I knew she was guaranteed a prize. She won a little stuffed bear (about the size of a Beanie Baby) and promptly named it Hershey. Since she played a game, we told the boys they could each choose one too. They both decided to do a Plinko-style game and they both won little Hershey bar stuffed animals. While Annelise rode a Midway ride, the rest of us enjoyed watching people try to win the game beside the ride. The goal was to throw a softball into a milk jug and judging from the size of the prizes you could win (they were HUGE stuffed animals), we knew it must be hard. Sure enough, we watched probably a dozen people try and fail. We were tempted to try- my husband had a tossing strategy after watching so many people do it- but we decided to pass. It doesn’t matter where you are in the park; you will never be far from food! Food carts roam around, full of cotton candy, popcorn, lemonade, and more if you’re in need of a quick snack. There are a bunch of “quick stop” booths, with just a few offerings, usually of a specific food (for example, Kettle Korn, Dippin’ Dots, and Dietz and Watson). There are also a number of other walk-up food stands that offer a wide range of items, from pizza to ribs, whoopie pies to funnel cakes. Finally, many famous chain restaurants have locations within Hershey Park, including Chick-fil-a, Dunkin Donuts, and Subway to name a few. We got lunch from the Outpost, which is a restaurant that caters to those with food allergies. It is nut, gluten, and shellfish-free. Our son has a peanut allergy, and although it’s not severe, I really appreciated Hershey’s effort to have a food option for people who do have severe allergies. It’s worth noting though, that if you’re not used to eating gluten-free, the options at the Outpost may not be well-received by your pickier eaters. My kids weren’t too thrilled by the gluten-free pizza crust, but they’re also just not used to eating that way. You can find more allergy info here. If performances are your thing, Hershey Park will not disappoint. We were there before many of the stage shows had opened for the season, so we didn’t make it to any of those, but there are several that have daily performances all through the summer. We were, however, treated to several performances by a strolling band. They were excellent and full of energy every time we heard them, from the beginning of the day, right to the end. 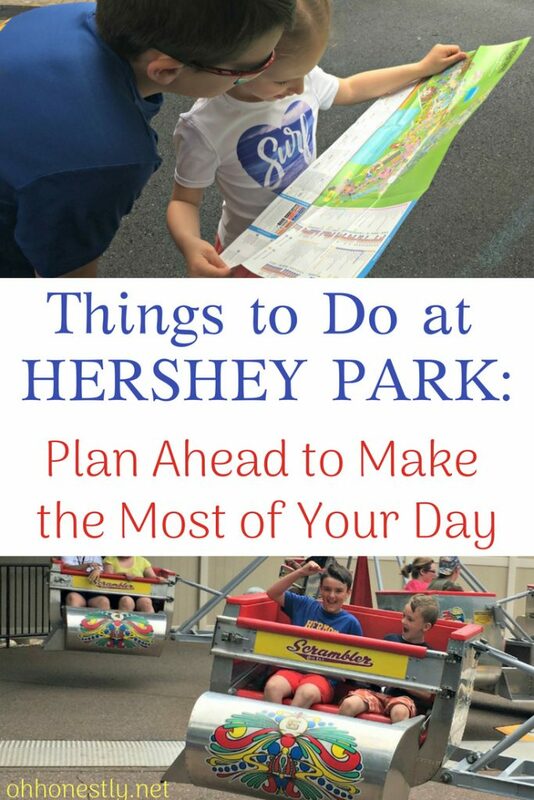 There are so many things to do at Hershey Park that I think next time we’ll plan to spend a couple of days there. Although our kids didn’t want to leave at the end of the day, they were still all smiles as we waited for the shuttle to take us back to Hershey Lodge. We definitely ended our day #HersheyParkHappy!